The winter is a great time to turn your attention to the inside of your home, particularly the basement. If you’ve neglected the lowest level of your home, you may be missing out on the opportunity for some wonderful remodeling projects. From man caves to wine cellars or an extra bedroom, there is a lot that can be done with a good-sized basement, even with a limited budget. Before the winter is over, explore some of the best budget-friendly basement remodeling ideas. Most basements are dark spaces containing a furnace, water heater, washer, and dryer. You may only venture down into the basement to do the laundry. Separating the laundry from the rest of the basement may help create a more inviting space. It is also an affordable project to complete. You don’t need to finish the laundry room by adding drywall and a drop-down ceiling. You simply need to section it off with framing and some OSB board. After putting in the framework for the walls with 2x4s, you can nail the OSB board in place. You can even use OSB to cover the ugly concrete walls. Creating a laundry room is also a great way to prepare your basement for additional basement remodeling ideas. With the washer and dryer separated from the rest of the basement, it may be easier to convert the rest of the space into a home theater or man cave. You can easily convert your basement into a place just for the guys. 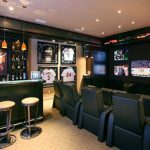 The best man cave ideas on a budget involve leaving the basement partially unfinished. There is no need to add extra insulation between rooms or cover every wall with drywall and a fresh coat of paint. For the walls, you may just want to section the man cave off from the washer, dryer, and other basement appliances. As with the laundry room, you simply need 2x4s and OSB board. A man cave is not complete without a bar. Affordable man cave bar ideas include converting an old kitchen countertop into a bar. The countertop may already have a cut-out for a sink, which is another useful feature to have in your man cave. You may even have space to add shelving for your glassware. Setting up a home theater is another fantastic way to get more use out of your basement and it’s something that the whole family can enjoy. It also includes many of the same considerations as setting up a man cave. With both remodeling projects, the focal point is the television. If you want to make your home theater as comfortable as possible, you can consider finishing the basement. However, this requires a lot of extra work. In fact, for major renovations, you’re typically better off working with experienced basement remodeling contractors. They can help plan a design based on your ideas while ensuring that your new space is both functional and built to last. While you may not need to install new flooring for a man cave or home theater, you may want to explore basement flooring ideas for a children’s playroom. Vinyl and carpeting are the best two options. Vinyl is durable and affordable while carpeting provides a soft, comfortable surface for your kids to play on. With the children in the basement, some parents may worry about keeping an eye on their kids. There are several workarounds to help you alleviate these concerns. Consider placing a video baby monitor in the room or strategically positioning a mirror at the bottom of the basement stairs. When standing at the top, you should be able to get a view of the playroom through the mirror. When you need to take work home with you, it’s helpful to have a place where you can get away from distractions, including the family and pets. Some of the most popular basement remodeling ideas involve converting the basement into a home office. If you decide to add walls to separate the home office from the rest of the basement, consider adding insulation. The insulation will offer a little bit of soundproofing to help eliminate distractions. During the colder months, outdoor remodeling projects are out of the question. If you want to work on your house through the winter, consider remodeling your basement. There are many basement remodeling projects that you can complete on a budget. Our company specializes in online marketing for remodeling companies. 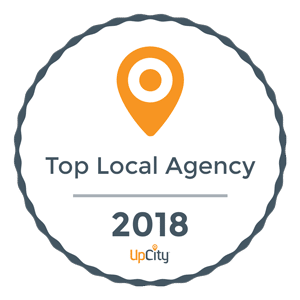 For a complete list of our services please feel free to Contact Us! Looking for a basement remodeler near you? Feel free to contact us, we have home pros located in all 50 states and Canada!